A beauty for your hair ? Just finished making a new style available in my store right now. Double sequin hair comb for special occasion. This hat is going to give the wearer a nice flattering filtered light through the soft coloured vintage straw. and the label goes in at center back (students take note) and ALWAYS straight AND by hand. I stitched the head band on the outside top and bottom as I wanted it flush against the hat - the effect is a little puffy which would normally drive me mad but I am willing to put up with it due to the soft straw. Tie tacking at various places so the velvet ribbon stays where I want it to. Turning back the edges of the velvet ribbon and stitching them so that the ribbon is not cut flush - trying not to pull the tread too tight which is tricky on such a soft open straw. Another spin in front of the mirror as next time I see this hat it will be on a customers head and I want to make sure that it all looks good to my eye BEFORE then as by the time it's on a head it's too late! In this photo you can see the effect of the big self turn edge on the straw I was talking about. Gathering the ends of the velvet so they can tuck under and will be hidden. Just checking the 'look' in the mirror, one of several checks I will do throughout the trimming. 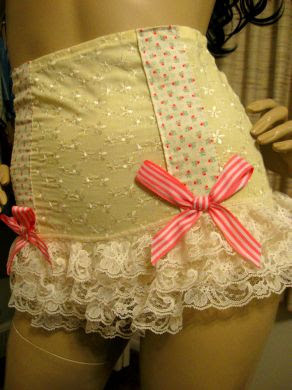 On to my poupee and the start of something interesting in the trim. I like the mix of textures between the straw and the velvet also the colours are good together - all important for a great hat. Start with the head fitting as this can be very handy to hang onto while you are trimming the rest of the hat. In this instance I have chosen to stitch it on the machine which I don't always do but as this straw is flimsy it can benefit by being machine sewn as this will make it more stable and hard wearing. Make sure that the back join is at the back. NOTE: a lesson here for my students as someone always starts the head fitting at the side or the front !! 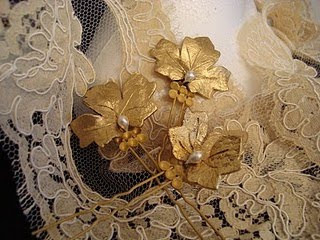 Always choose the EXACT same colour cotton as the head fitting ribbon. Pinned in place I then sewn on the trusty vintage Singer, my only sewing machine. My sewing machine is from the 1950's and is an excellent straight sewer with a very even stitch length and she will sew any fabric. I have had this vintage hood for ages (15 years!) and finally got around to dying it (it was hideous bright yellow and pale pink at the edges) and was blocking it up and thought I would share the process with you. I hope to not bore you with too many details but there are lots of tiny processes in the creation of this type of hat and they kind of all have to come together to get this beautiful effect. 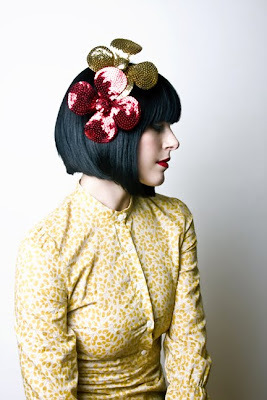 My hats often start as a vague idea and I have a fairly flexible idea of how I want them to end up - they evolve. This type of straw is a beauty in itself and very little is needed to enhance the effect. I trimmed it with the last of my favorite colour of velvet ribbon really just to use up the roll (so I have an excuse to get another roll !). It is a glorious colour and think it suits the vintage straw - I ended up with this great taupe straw colour by dying the straw and ended with this colour mostly by accident but LOVE it ! One of my students calls me the 'queen of bows' (!) 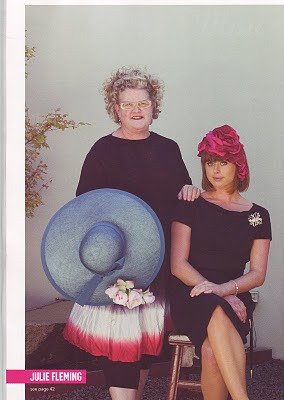 and I must admit to liking the effect a well structured bow has on a hat. I also like the turned edge on this straw as this type of 'fancy crin' hood is more often than not weak around the edges and looks better to my eye if you turn it back on itself onto a sturdy wire to create a wide self edge as I have done here. Any questions ? happy to answer any questions you may have. check it out the latest from another creative type in Melbourne - there are so many wonderful people making the most wonderful things.....glamour girl underwear anyone ? A lovely shop I have just noticed here in Melbourne (great window displays) if you are interested in children's wear and vintage toys check this out LOVE the vintage cutie kewpie dolls. A little addition to our store here at 456 Malvern Road, Hawksburn a great PVC bow belt. Perfect amount of bow there ! 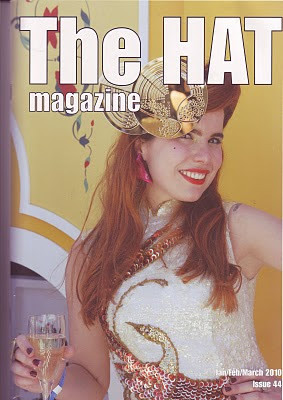 The latest edition of English 'The Hat Magazine' is out and I am featured as one of Melbourne's Milliners. It is Issue : 44 Jan/Feb/March so if you get a chance have a look, we were lucky to have the lovely Carole Denford out here to help promote the industry. We are attending Fashion Exposed 'Preview' in Sydney from 13th February till 16th February 2010 at Darling Harbour. Stand Number 4420. 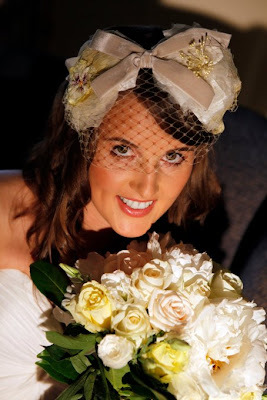 Emily's lovely headpiece I made for her wedding. Some photo's of it being made and the end result - just beautiful and I love the vintage velvet ribbon such a wonderful colour. Vintage blossom ! 'My wedding went really well. My headpiece was gorgeous and I am still getting comments on it. Thank you so much for all your brilliance.